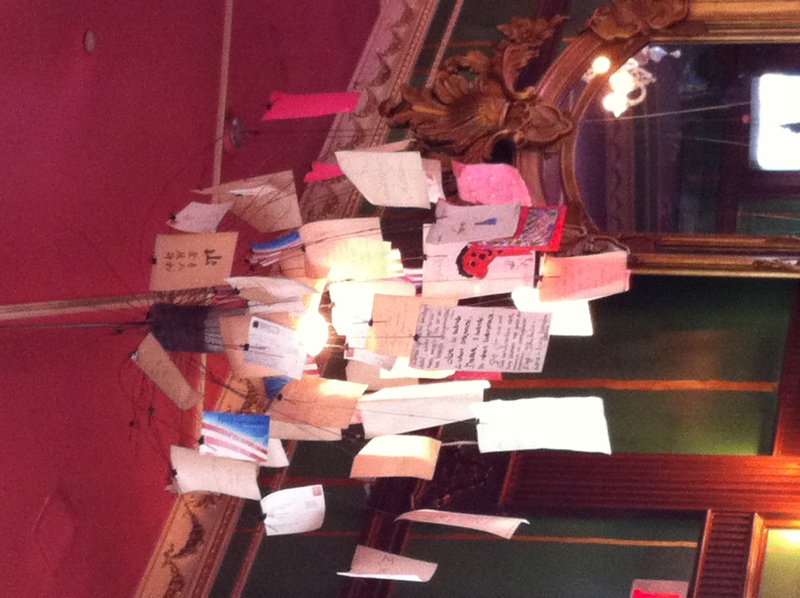 Dining at UpStairs on the Square is a little bit like being in Alice in Wonderland– the walls are brightly painted, the furniture is mismatched, there are weird, whimsical fixtures hanging from the ceilings, and nothing is quite what it seems. This is a new opinion for me – I used to regard UpStairs as one of Harvard Square’s finer dining establishments, set apart from the pub food of Grendel’s and the budget Thai of 9 Tastes. Last summer I had a fantastic dinner on the UpStairs patio, and last winter I had an excellent meal in their Soiree Room, during which I was introduced to one of my favorite wines, a 2006 Achával Ferrer Malbec. Based on these experiences, I chose UpStairs as the scene for a recent birthday dinner. But rather than being able to relax and enjoy, I felt as though I was Alice, falling down the rabbit hole. One of the reasons to go to UpStairs on the Square is the wine list, which arrives as a fat binder, not just a few afterthought pages. UpStairs holds wine tastings and wine dinners, they employ a Wine Director, they were given a Wine Spectator Award in 2010 – all signs point to this restaurant taking their wine seriously. So when we ordered a pricey bottle from the list, we just assumed it would be available. Ok, that’s fine. Understandable, even- sometimes a discrepancy occurs. So we ordered a different bottle of wine. Our waiter came back with a Cheshire Cat grin – our second choice was unavailable as well. Tricky Sommelier, is your wine list really a riddle? Do I need to ask for it in a certain way? Must I slay the Jabberwocky before I can get a drink? We ordered a third bottle, and it came. Frazzled, we admittedly didn’t check the bottle before it was poured. Once we tasted it, however, we realized we were drinking a Cabernet, not the Pinot Noir we’d requested. Spent, we drank it anyway, and polite, we didn’t make a fuss (though we did alert the waiter to the mistake). But when you’re spending good money on a bottle of wine, shouldn’t you at least get the bottle you order (on your third try)? And if you don’t, shouldn’t you at least get an abject apology, or a complimentary dessert? (We got neither.) Every establishment has an off night, but this wasn’t just off, it was never on. Despite the wine debacle, the food was, as always, lovely. UpStairs has two dining rooms, the more casual “Monday Club Bar” and the fancier, more expensive Soiree Room. I’ve eaten from both menus, and both have been good. On our infamous Third Bottle evening, I enjoyed the Tuna Sashimi – very fresh, excellent marinade – and the Day Boat Scallops – nicely seared. My companions had the Sockeye Salmon and the Mushroom Risotto, recommended by our waiter/the Cheshire Cat. The risotto was the gold-star winner of the evening, with a depth of flavor and perfect consistency. Wanting to give UpStairs a chance to redeem themselves from their previous service issues, we went back for brunch last weekend. They have a varied brunch menu served in the Monday Club Bar, with a three course special offered from 10-11am. The prices, $7- $20, are reasonable for the quality and portion, and the food, starting with an excellent basket of assorted sweet breads, is good. Unfortunately, trying to get served at brunch was a bit like trying to corral the Mad Hatter at tea time. We arrived at 10:00am to an almost empty dining room, and the host asked if we had a reservation. We did not, and this is presumably why we were seated behind a partition next to the fireplace, at the end of the bar. It’s nice to have a quiet corner for breakfast, but only if your server remembers you’re there. After waiting 20 minutes for any acknowledgement, I poked my head into the rest of the room and joked “just want to make sure you didn’t forget about us!” The staff didn’t laugh, but at least we got coffee and some bread. After fifteen more minutes, we even got to order. 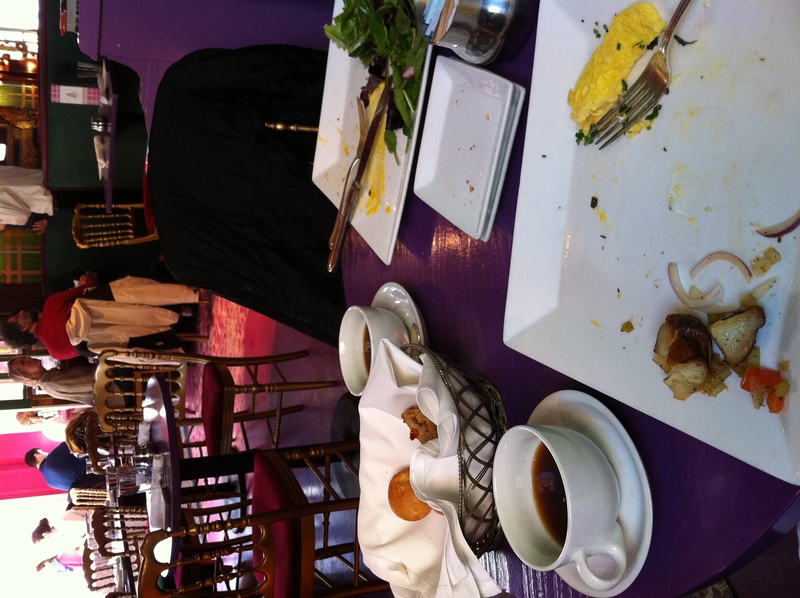 Eventually, we were able to actually eat our food, and the Omelette and Monte Cristo were lovely. Here’s the thing: no matter how good the food is, the service plays a role in how everything tastes. I want to relax during my meal, I don’t want to feel like I have to manage my server or my food and wine- that’s why I paid money to go out. And even though everything we ate – at both Third Bottle night and brunch – was good, when I look back on both of these events, annoyance creeps into my memory. I wouldn’t discourage anyone from going to UpStairs, but I won’t make it a point to go back for a while. I’d rather go to Kelly’s Diner -where I expect surly service with my blueberry pancakes- than take another trip to Wonderland. That’s telling them for me! !